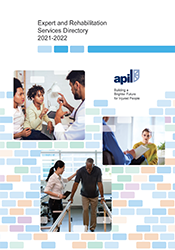 The APIL experts and rehabilitation services directory provides contact details for over 650 experts, covering 320 specialisms. The directory also contains 162 rehabilitation providers which can be found to the back of the publication. APIL members receive the experts and rehabilitation services directory once per year at no additional charge. If you are interested in becoming an APIL member, please see our join APIL page. If you are not an APIL member, you can purchase our experts and rehabilitation services directory for £50 by completing the form below and clicking submit. We will contact you to complete the payment once your request has been processed. If you would like to place a ¼, ½ or full page advert in the forthcoming Expert & Rehabilitation Directory please download, complete and return with your payment the booking form.